Visiting Dubai is amazing, and cruising down Dubai make it more romantic tour. If you are looking to relax yourself and have a piece of quiet and calm Dubai with charming lights of Creek with Belly dance & Tanura Dance show, Music and BBQ buffet dinner with your favorite drinks than dhow cruise Dubai is best tour for you. We will take you in a traditional boat called Dhow Cruise that will float on the marquee waters of Dubai Creek or Dubai Marina, providing serene and calm environment, the beautiful lights of the tall building surrounding the area under a beautiful night sky. Simply ride in our dhow cruise dubai and enjoy the night. We will serve a 5 Star Buffet dinner on the cruise. You can get on the cruise deck to have clear view of the night sky and the reflection of buildings in the water alongside moon. Dhow cruise dubai is another trip you will like most. We offers four different cruising services in Dubai. We are too much flexible in terms of offering you dhow cruise deals. If you want to enjoy romantic dinner under the lights of sky skipper of Dubai marina you can book our dhow cruise dubai marina and In case you only want peace of mind and just cruising under Dubai lights with lite and romantic music try our dhow cruise marina sightseeing tour, detail information about both dhow cruise deals are mentioned below. If you are staying far from Dubai marina and want to enjoy dinner in Dubai creek dhow, you are at right place to book a romantic night under the moon in the center of Dubai with your loved ones. On creek dhow you can either go for dinner or if you just want sightseeing of Old Dubai from sea you can book our creek sightseeing dhow tour. Detail information about creek cruise are mentioned below. Dubai Marina is the largest man made marina in the world and provides exquisite views of architectural genius that surrounds the Dubai Marina. You can either book a sightseeing cruise in day to enjoy the wonderful ride on dhow cruise while you gaze on the tall standing buildings surrounding the Dubai marina or enjoy the magnificent night under the stars on the wooden traditional Dubai dhow cruise. A 5* buffet and other entertainment facilities like belly dance show and your favorite drinks are available on our Dhow cruise Dubai marina. 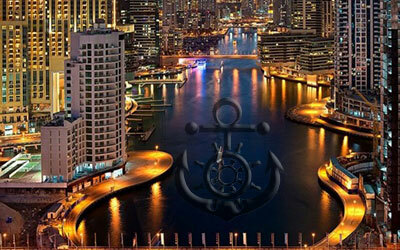 Looking to enjoy the dhow cruise dinner in Dubai Marina. Join us for our Marina Dhow cruise dinner. "For Dhow Cruise Booking Call Us : 00971-52-233-0242"
Sail across the Dubai Creek on the traditional Arabian Dhow Cruise. Creek is part of the older Dubai and the Dhow Cruise Dubai sails along the heritage village, Gold and Spice Souk, Rolex Towers and other famous locations in the older part of the Dubai. You looking for some old arictature of Dubai this cruise tour is perfect for you. we have another dhow cruise deal for you, join us either for sightseeing cruise during day hours or spend time under the night sky having 5* dinner on the traditional wooden but modern equipped Dhow Cruise. We offer tanura dance or magic show on creek Dhow Cruise as well. 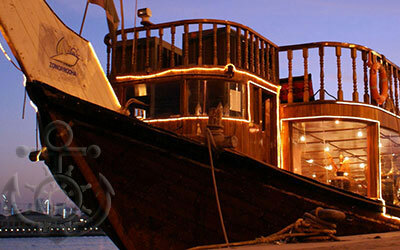 Looking to enjoy a romantic dinner on a traditional Dhow Cruise that takes your across Dubai creek. Join us for our creek dhow cruise dinner. We usually get phone calls and emails regarding different questions about dhow cruise Dubai booking, prices, availability, menu severed in dinner and so on, frequently asked questions are mentioned below with proper answers. Dhow Cruise with dinner price? Dhow Cruise Prices are depends where you want to enjoy your evening. Marina Dhow Cruise price per adult is 150 AED and 130 AED per child, Creek Dhow Cruise price per adult is 120 AED and 100 AED per child. Dhow Cruise Dubai Marina Price? We have two different offers for Dubai marina cruise, If you are looking for dinner in dhow cruise Dubai marina than the price per adult is 150 AED per adult and 130 AED per child, and if you are looking marina sightseeing tour than the price per person is 120 AED. 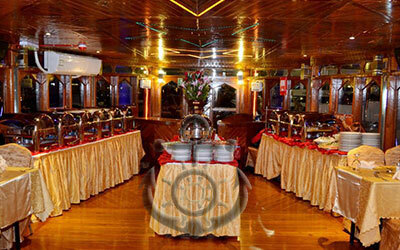 Dhow cruise creek prices without dinner is 100 AED per person. And sightseeing of Dubai marina is 120 per person. Dhow cruise Dubai timing is different for different tours, like for marina dhow cruise dinner is 8:00 PM - 11:00 PM and dhow cruise dinner creek is also in between 7:00 PM - 10:00 PM. Dhow Cruise Dubai Creek Deals? At the moment we don't have any deal for the dhow cruise Dubai creek, but occasionally we offer deals for the dhow cruise. Dhow Cruise Dubai Marina Deals? At the moment we don't have any deal for the dhow cruise Dubai marina, but occasionally we offer deals for the dhow cruise. Dhow Cruise Dubai Creek Menu? Dhow Cruise Dubai Marina Menu?